Allow the webmistress to introduce herself. My name is Karina, I am in my 40s and live in Perth, Western Australia. 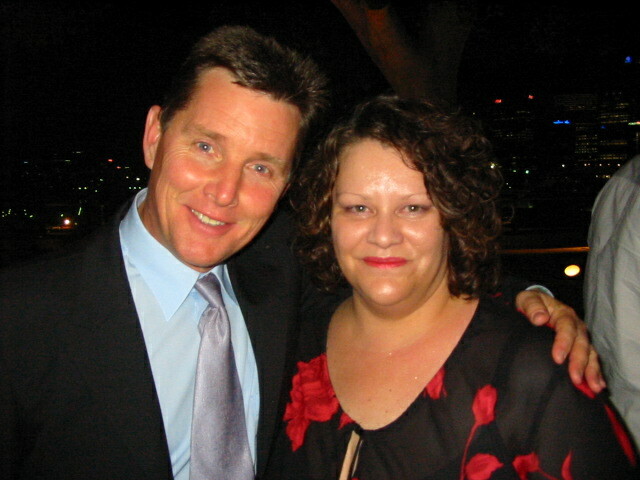 I have been a big fan of Tom Burlinson's ever since I first saw The Man From Snowy River in 1982. Through my own searching experiences in the 90s I discovered there just wasnt much on the internet about Tom, despite the fact that he has been a prominant face in the Australian TV, Film and Stage industry since the mid 70's. He got a mention on many pages out there - but there wasn't a site dedicated to him. I hoped to remedy that. Initially I built a single page on my own home page in 1998 consisting of a couple of pictures and a small bio. I was surprised when that page started getting a lot of visitors from around the world. It was clear that others wanted more info about Tom so in May 2001 I commenced construction on the fansite. I compiled as much as I could for this site from my own collection of clippings and posters etc dating back to 1979. Where possible I have named the publication and the date. With Tom's kind permission this became The Official Fan Site in September 2001. I purchased the tomburlinson.info domain name in 2003. As it has taken me many years to build this collection, I would really appreciate it if you looked, enjoyed, but didn't steal the content or the images. Please ask me for permission to link to this site or to borrow pics from the site. My thanks to Abby, Toms US fan club president in the 80s - inheriting your Tom collection has made my own collection simply amazing. Thank you also to my friends who are always on the lookout for news articles and theatre programs etc, SueAnn and Trevor - your help has been invaluable !! Do you have an interesting link to something that involves Tom ? Feel free to leave your contact details in the guestbook or forum and I will contact you to discuss. SPAM: How to minimise it but still be contactable. In an effort to combat spam I am removing my email address from my websites. I am getting approximately 200 spam emails a day and my concern is that while I am busy deleting them I may delete an email from you in error. Please direct all your queries to my guest book or discussion forum where I will visit and respond regularly. Please feel comfortable in posting your email address in disguise so I can reply to you. There are some methods you can use which will make your address understandable to me but which will prevent the auto spam address harvesters being able to use your address. You can use this method where ever you post your address in public areas of the internet ie forums, guestbooks, message boards etc. Anyone who wants to contact you (ie me) will know to remove the extra '.com' or the 'nojunkmail' bit. We need to band together to help stop the unrelenting spam from invading our lives.